Sherrie, is there a blessing I can use, to get rid of a shroud of darkness and negativity? Thank you for the question Misty Fox, sending blessings your way. Please try the following meditation. You can heal. Optimum health and emotional, mental and spiritual wellbeing requires a consistent flow of high vibration energy through your total being. Thinking positive thoughts and loving and forgiving yourself and others increases and allows nourishing and revitalizing energy to flow through you. However, we are not always consciously aware of the negative energy and past emotional pain and trauma that lies hidden within our body, mind and spirit. When we suppress and repress emotional pain and traumatic experiences, this forms energy crystals which block and obstruct the essential flow of energy throughout the body. Similarly, old and habitual negative thoughts, limiting beliefs, fear and anger creates a sluggish and low vibrational energy frequency. It is never too late to free yourself from the damaging effects of unknown and hidden destructive emotional and mental energy. As you uncover and release old and low frequency energy, the authentic you emerges like a full blooming lotus from the dark depths. The following meditation/visualization will empower you to release and dissolve past and hidden emotional wounds and negativity that have formed crystalized and damaging pockets of energy. Lie down or sit in a comfortable and quiet place where you will not be disturbed. Close your eyes and begin to breathe long deep and relaxing breaths. When you are relaxed, imagine breathing white light energy down through the top of the head and move it down through your body. Release any stress and tension as you exhale. Continue to breathe white light breath down through the top of the head and exhale any stress and tension anywhere in the body as you exhale. If you are having a difficult time, moving white light breath through the body, ask for presence of an angel or archangel or Mother Mary to assist you. Once you feel a sense of lightness and relaxation, inhale a long deep breath of white light down through the top of the head and slowly move it through the body, scanning your body as you do this. Become aware of any place in your body where you feel tense, tight or sore. Take note of these places and continue to breathe and scan for any other places of tightness or tension. Once you have completely scanned your body, draw your attention to the area where you feel the most tension and tightness. Tune into the energy of this area. Imagine that this energy has a particular color and texture. It might be ruff, smooth, mushy or hard or any other texture. Once you have a sense of its color and texture, imagine that this energy has a voice and can speak to you. What is it saying? If the energy does not speak to you, this is fine. Just continue to tune into it and pay attention to anything that you feel, hear, sense or know or any images that emerge. Now imagine white light energy moving down through the top of your head, send it to this area of blocked energy. If you would like, you can also ask for the presence and assistance of angels or other divine beings. 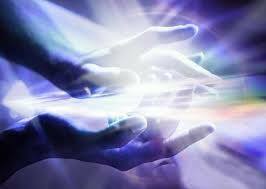 Invoking divine white light empowers, protects and heals. Continue to breathe white light energy down through the top of your head and imagine that it is dissolving and dissipating the blocked energy. During this process, confusing emotions may surface or you may have a sudden urge to stop the mediation. This is ego-mind resistance and common when you let go of and release stuck energy. Continue breathing in white light energy and work with it to dissolve and dissipate what you no longer need. When you feel a sense of completion, breathe and feel the energy flow through your body. Imagine this energy moving at a high frequency, uplifting your vibration to that of light. Allow this energy to fill your heart, mind and spirit, especially the places that have been stuck or feel blocked. When you feel that that you have done all that you can at this time, take a few moments to quietly breathe and relax. Listen within and pay attention to any sensations, thoughts and feelings that surface. Send gratitude to the angels and divine beings who have assisted you in this process. Open your eyes and write down anything that you would . This entry was posted in Uncategorized on April 14, 2015 by Sherrie Dillard.